I just love this time of year- even more so than New Year’s it surrounds us with a feeling of renewal and fresh starts. 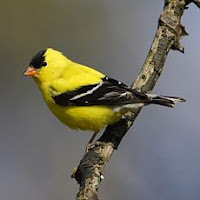 Keep your eye out for all the goldfinches around- they are an amazing bright yellow and the males have a beautiful song. In honor of spring I am offering a series of special personal training packages tailored to your specific training goals and budget! Target these common spots of weakness from too much time at the desk, computer, car, or bike. Learn a sequence of exercise just right for you to improve posture and strengthen these critical muscles. Already active with a workout routine but want to focus in on your core to improve strength, posture, or confidence? You will love this workout designed to strengthen the most important muscles in your body. Designed for those over 65 and looking to improve strength, balance and mobility. Perfect for those looking to maintain health and strength and can easily be tailored to support individuals with low-bone density, Parkinson’s, or other health concerns. A fast and fun 30 minute workout for the client 16 and under who would like to become more active or improve sports performance. A fantastic opportunity for those new to a strength training program or with schedules too busy to commit to 60 minute sessions. We will address each major muscle group quickly and efficiently and get you back on your way. Each workout is a fast and efficient 30 minutes and affordably priced at six sessions for only $55! The sessions expire six weeks after purchase and appointments at this price are only available Monday-Friday. Medical release may be necessary for some clients prior to beginning a program together. Any questions? Just let me know how I can help! Thanks for your comments on my blog about kids. I tell you, they are worth the work, but some days it is hard to see the big picture. I think we all have moments of weakness, but what makes us stronger, is learning from them. I like to tell myself that my kids give me a lot of learning moments. If you don't mind, can I add your blog to my roll? I'd like to keep in touch with it!